Do you remember the first curse word you ever heard? Maybe you remember the first time you said a “dirty” word in front of your mother? If she was like my mother, you got your tongue washed with soap so you would remember not to say that again. There seems to be a lot more profanity today. At one time it was censored from movies, TV, and the media. Now we hear it everywhere. Cursing is a lot like smoking. It directly harms the curser, and indirectly harms those who hear it. Those who hear cursing suffer like those who inhale second hand smoke. Even though you don’t do it, you are affected. Do you have to listen to a lot of profanity at home, work, or school? Profanity is more than cursing. It is any degraded speech. Do you have a problem with cursing, gossiping, criticism, coarse jesting, or lying? If so, God has an app for that! James 3:1-12 Not many of you should presume to be teachers, my brothers, because you know that we who teach will be judged more strictly. We all stumble in many ways. If anyone is never at fault in what he says, he is a perfect man, able to keep his whole body in check. When we put bits into the mouths of horses to make them obey us, we can turn the whole animal. Or take ships as an example. Although they are so large and are driven by strong winds, they are steered by a very small rudder wherever the pilot wants to go. Likewise the tongue is a small part of the body, but it makes great boasts. Consider what a great forest is set on fire by a small spark. The tongue also is a fire, a world of evil among the parts of the body. It corrupts the whole person, sets the whole course of his life on fire, and is itself set on fire by hell. All kinds of animals, birds, reptiles and creatures of the sea are being tamed and have been tamed by man, but no man can tame the tongue. It is a restless evil, full of deadly poison. With the tongue we praise our Lord and Father, and with it we curse men, who have been made in God's likeness. Out of the same mouth come praise and cursing. My brothers, this should not be. Can both fresh water and salt water flow from the same spring? My brothers, can a fig tree bear olives, or a grapevine bear figs? Neither can a salt spring produce fresh water. Words are spoken by our tongues and they are powerful. This message is entitled “Curbing the Tongue” for a reason. A curb controls the flow of water and traffic on a street, keeping both in their beneficial place and preventing them from doing damage. We need to erect some curbs on our tongue to keep our words beneficial and from doing damage to others. The old saying, “Sticks and stones may break my bones, but words will never hurt me,” is a lie. Words have the power to hurt deeply and permanently. They also have the power to heal. The truth about words is found in Proverbs 12:18 Reckless words pierce like a sword, but the tongue of the wise brings healing. Therefore, words can have a positive or negative effect. First, let’s look at the positive power of the tongue. The tongue has power to instruct through teaching and preaching, which is a positive effect if the truth is shared. (vs 1 Not many of you should presume to be teachers, my brothers, because you know that we who teach will be judged more strictly.) This beneficial use of the tongue carries a warning because of its tremendous influential power. Those who teach and preach are held accountable to God and to man for what they say. Not only will teachers and preachers be held accountable for their words, Jesus also said everyone will be judged by the words they say. Matt 12:35-37 “The good man brings good things out of the good stored up in him, and the evil man brings evil things out of the evil stored up in him. But I tell you that men will have to give account on the day of judgment for every careless word they have spoken. For by your words you will be acquitted, and by your words you will be condemned." The tongue also has power to give direction, vs 3-4 When we put bits into the mouths of horses to make them obey us, we can turn the whole animal. Or take ships as an example. Although they are so large and are driven by strong winds, they are steered by a very small rudder wherever the pilot wants to go. Our little tongue directs our whole body. However, notice the tongue can also be steered by a bit or a pilot. A pilot determines where the ship will go by using the rudder. The Holy Spirit is supposed to be our pilot. Although the tongue is untamable by man, it is possible for God to control it. Furthermore, verse 2 indicates that if the Holy Spirit fills our heart and controls our tongue, our entire body will be under control as well. To begin controlling the tongue, we must control what enters our eyes and ears. What we see and hear goes into our heart. If you are a parent, you have the responsibility to control what your children see and hear. As a parent, God holds you accountable for what your children listen to or watch on the TV, computer, radio, and telephone. Garbage in—garbage out. Faith in—faith out. It is that simple. Therefore, a heart filled with the goodness of the Holy Spirit will say good things. The tongue also has the power to encourage. Our tongues are to be controlled by the Holy Spirit to encourage and benefit the listeners. Too often our tongues are controlled by a demonic critical spirit, grumbling and complaining, and finding fault with everyone and everything. We need to rebuke that spirit, repent of this sin, apologize, and ask God to forgive us and fill us with His Holy Spirit. Eph 5:4 Nor should there be obscenity, foolish talk or coarse joking, which are out of place, but rather thanksgiving. The next time you are tempted to criticize, stop and ask God to show you a reason to compliment. If we are first thankful, appreciative, and complimentary of a person’s efforts, then we can share ideas we think are improvements in a loving way. Prov 25:11 A word aptly spoken is like apples of gold in settings of silver. Prov 18:21 The tongue has the power of life and death, and those who love it will eat its fruit. When we condemn, criticize, slander, gossip, lie, or curse, we are using our tongues destructively. Just like fire, which is destructive when uncontrolled, words are destructive when out of control. Furthermore, like a spark of fire, it just takes one little careless word to create a lot of havoc. On the other hand, a prescribed burn is a beneficial fire allowed to burn under certain weather conditions for purpose the fire boss wants to accomplish. He controls the timing and tactics of burning so the fire stays under control and remains beneficial. Before burning, the fire boss constructs fire lines to curb the fire’s advancement. 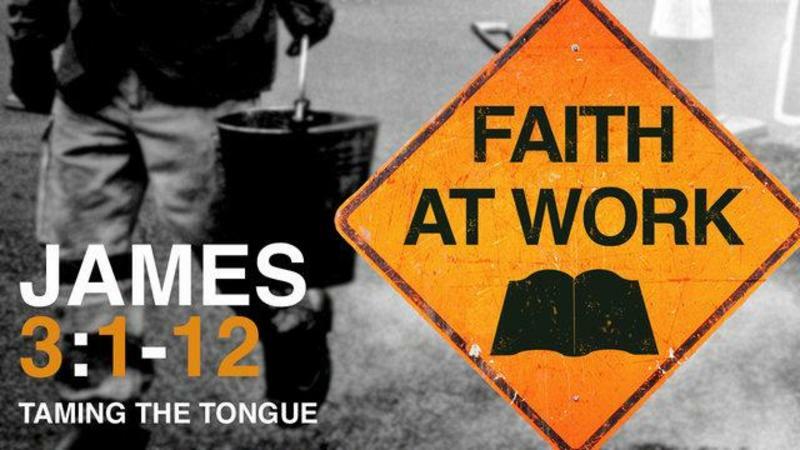 Likewise, we need the Holy Spirit to be the fire boss of our tongue. If we let Him be boss, the Holy Spirit will curb our tongue, controlling what we say and how we say it so that our words will be beneficial to the hearers and accomplish His purpose. Psalm 15:1-3 Lord, who may dwell in your sacred tent? Who may live on your holy mountain? The one whose walk is blameless, who does what is righteous, who speaks the truth from their heart; whose tongue utters no slander, who does no wrong to a neighbor, and casts no slur on others. So who is going to be in God’s Presence--the people who say they believe? No, it is the person who believes and walks uprightly, speaking the truth from a Spirit-filled heart; furthermore, "whose tongue utters no slander, who does no wrong to a neighbor, and casts no slur on others." Unfortunately, we sabotage a lot of our prayers because we’re doing what James says in verses 9-10 (With the tongue we praise our Lord and Father, and with it we curse men, who have been made in God's likeness. Out of the same mouth come praise and cursing. My brothers, this should not be.). One minute we’re blessing God in church, and then afterwards we’re cursing men, who are made in God’s image. Perhaps we are not blaspheming or using foul language, but we may be criticizing or slandering our fellow man. One minute our tongues are speaking about holy things, and the next, unholy things. This should not be--if our hearts are right. Our words reflect what’s in our hearts. If a man loves sports, he talks sports. If he loves money, he talks money. If she loves art, she talks art. There’s nothing that gives us away as much as our speech. Our speech shows where our hearts are. We can’t cover up our heart. If there’s bitterness in our hearts, it will come out through what we say and how we say it. If there’s hatred, hatred will come out our mouth. If there’s anger, anger will come out. No wonder James says that the tongue can’t be controlled. The heart is generating all that the tongue is going to say. The heart is the factory that produces all these vile things. The tongue is just the showcase of the heart. One of God’s apps is for us to cry out and pray earnestly as the psalmist did in Psalm 51:10 "Create in me a pure heart, O God, and renew a steadfast spirit within me."? God can take the foulest heart and make it pure and beautiful and eloquent for Himself. Surely one of the most amazing things about the transforming grace of God is that a born again person loses their filthy language, lying tongue, and unholy speech when they get saved and filled with the Holy Spirit. This is a serious issue, brothers and sisters. There’s little use carrying a big Bible and wearing a lapel pin saying how spiritual we are, if we explode at home or in the office, curse our children, or if we’re critical and bitter and known as somebody who has diarrhea of the mouth. If the Holy Spirit were in control of our tongue all the time, we wouldn’t come out with the rubbish that we utter so much! So what is God’s solution, His app, for our condition? First, humble yourself and acknowledge you have a problem with your tongue because you have filthy heart. Realizing you have a problem is half of the solution, because it puts you in the position of receiving God’s forgiveness and grace. Second, confess and repent of this sin before God, and be sorrowful for your hurtful speech. Apologize and make restitution where possible. Don’t skip this step for it will bring healing in your life and in your relationships. It is putting your faith into action. Third, replenish what is in your heart with good things, holy things. Control what you see, hear, read, and who you spend time with. Look at, listen to, and read holy things. Fellowship with godly people. Lastly, the most important use of our tongue is found in Rom 10:9-10 If you confess with your mouth, "Jesus is Lord," and believe in your heart that God raised him from the dead, you will be saved. For it is with your heart that you believe and are justified, and it is with your mouth that you confess and are saved. If you have never done that, come forward during our hymn of invitation and make that confession today. Until you do, you will always have problems with your tongue, because you have a heart problem. It is missing the Holy Spirit. If you have confessed Jesus as your Lord and followed Him in baptism, then tell others about your salvation, for that is a beneficial use of your tongue. Rom 10:14-15 How, then, can they call on the one they have not believed in? And how can they believe in the one of whom they have not heard? And how can they hear without someone preaching to them? And how can anyone preach unless they are sent? As it is written: “How beautiful are the feet of those who bring good news! Ask the Holy Spirit to direct your heart towards God, make Him your pilot, and give Him control of your tongue. Then you will have grace to use your tongue for God and for the benefit of others.